walter wade wrote: In the restaurant Brick Ovens, eg, Spacca Napoli, what is their cooking oven temperature??? Anybody know for sure?? I thought maybe 800-900 degrees?? Whole Foods is only 560 or so, for their brick oven. Spacca's oven, which was built by Agliarulo (imported from Italy) can get up to 1,000 degrees. Katie, are you considering the effect of placing cold food on the hot stone and the change in temperature at the surface that causes? Maybe I'm just making hasty conclusions from my observations with cast iron, pizza ovens, dutch ovens and other cooking vessels that depend on having a heat-holding mass slowly get up to temperature, and stay there consistently and evenly, even as the heat source is taken out of the equation or cold foods are added. I'm no thermal engineer, that's for sure. By the way, re-reading the posts above, I am not sure we are saying anything different from each other. The thinner, less mass-y stone is going to cool down faster as you throw pies onto it. Thus the reason to use a larger, mass-ier one that takes longer to heat up (or a brick pizza oven, which takes forever to heat up). On a related note, I have a brick pit for BBQing pigs. It is about the size of a modest burial vault you might see in Louisiana and has a lot of bricks to heat up before it hits 275-300 degrees consistently. I heat it up the night before with a ton of hardwood and natural charcoal. The next morning, I place a cold 120# pig on it and hardly have to add more than a bag of addional charcoal and a couple of logs through the day. If I just started a fire the morning of the cook, I could surely get the surface temp to 300, but the pig would take much of the energy and I'd be chasing the temp all day, adding hot coals and watching the thermometer zoom between too hot and too cold all day. I did this. Once. That's also why the brick pit, with all of its moderating mass, is superior to even the snazziest metal rig, in my humble opinion. Same goes for the pizza oven, attached to the pig pit. I think you are right, JeffB; I think we are saying the same thing. Interesting discussion, and interesting description of your roasting pit. 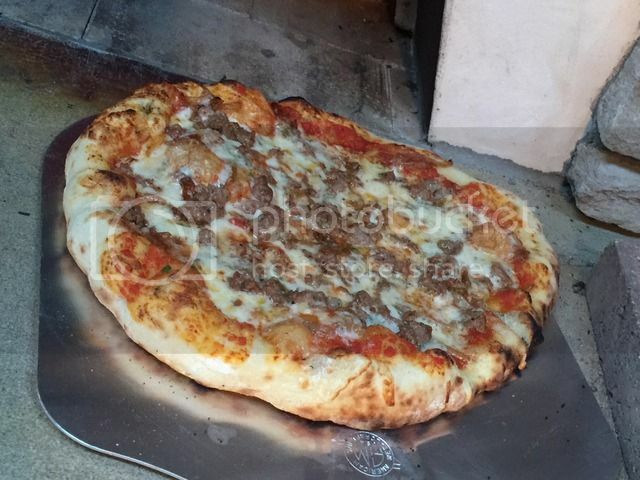 I made Lahey's dough the other day & fired up 3 pizzas yesterday. The first one stuck mercilessly to the stone. Pies two & three lacked some char on the underside, but I put them on parchment anyhow. 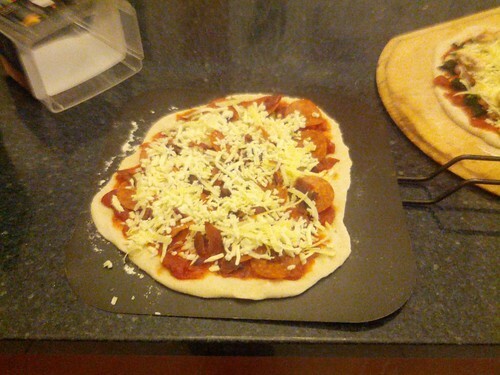 I still have a considerable amount of scorched dough & cheese on my stone. First attempt at making pizza on my grill. Also, first time I tried to make dough from scratch. Used Reinhart's Neo-Neapolitan recipe with KA Bread Flour. Left it in the refrigerator about 24 hours. I need a lot of practice at stretching out the dough. Ended up with some weird shapes and uneven crusts. Was frustrating. Fairly pleased with the results of the grill though. Got it up to 600 degrees based on the thermometer in the hood. 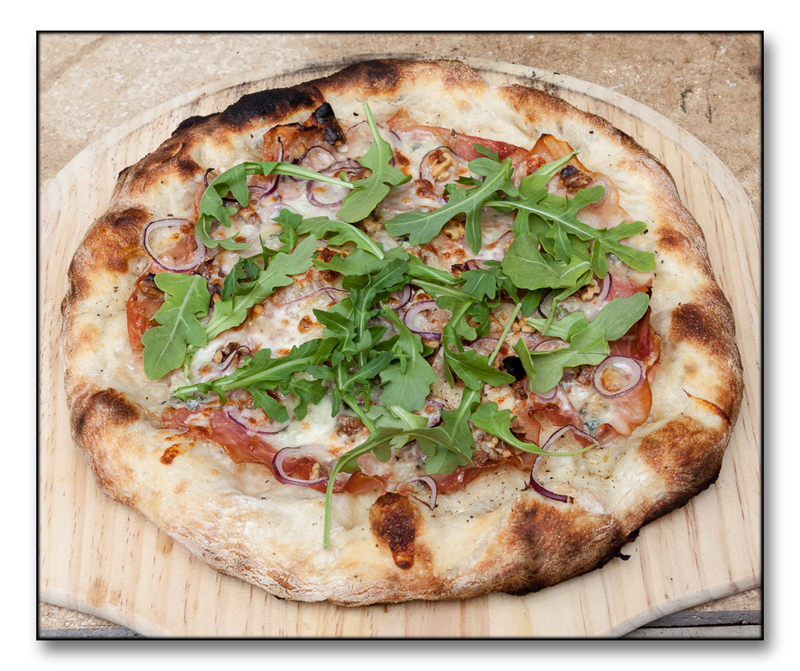 pancetta, walnuts, gorgonzola, red onion & arugula pizza. I was thinking about getting a perforated metal pizza peel (like this http://www.amazon.com/PROFESSIONAL-PIZZ ... 00BM8PSB0/). Does anyone know where you could find one locally in Chicago? Labriola Cafe in Oak Brook uses a similar peel. BTW I enjoy their Alsatian Tart Flambe Pizza - Fromage Blanc, Coriander, Applewood Smoked Bacon and Poached Onions. jblth wrote: I was thinking about getting a perforated metal pizza peel (like this http://www.amazon.com/PROFESSIONAL-PIZZ ... 00BM8PSB0/). Does anyone know where you could find one locally in Chicago? You might want to give GNR Northwestern Cutlery a call. Davooda wrote: Wimperoo - do you cook directly on the plate setter on your BGE or use the grill and a metal pizza grate? Not Wimperoo, but I am of the plate setter/pizza stone on the Big Green Egg school. 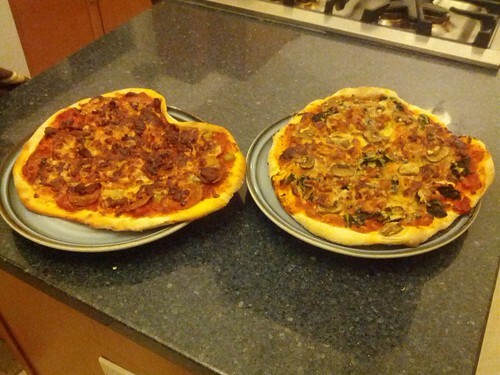 In fact I made a few pizzas Saturday on my Big Green Egg. 2C AP flour, 2/3 tsp salt, 2 tsp olive oil, 2/3C water. Yeah, I forgot the yeast. I didn't think anything of it when I took it out of the machine, and punching it down didn't do much... or when I took the balls out of the proof-mode oven, and they hadn't grown significantly. And baked up nicely at 500F (convec) -- I should have pre-heated the stone a bit longer, as they came out nicely browned on top but a little wan on the bottom. The dough was a little bland, and had a nice chew, but I can't believe it came out edible without a rise. dansch wrote: I want to fire up my Weber and see what I can do outside, thought my last set of Weber kettle pizza baking experiments gave me good charred bottoms and barely cooked tops. I've got a few ideas on how I can improve on those results, so I just need to get out there and try. I wonder what evolved with your experiments cooking pizza on a Weber Kettle. Cook's Illustrated has endorsed KettlePizza Pro for cooking pizzas on 18- and 22-inch Weber grills. 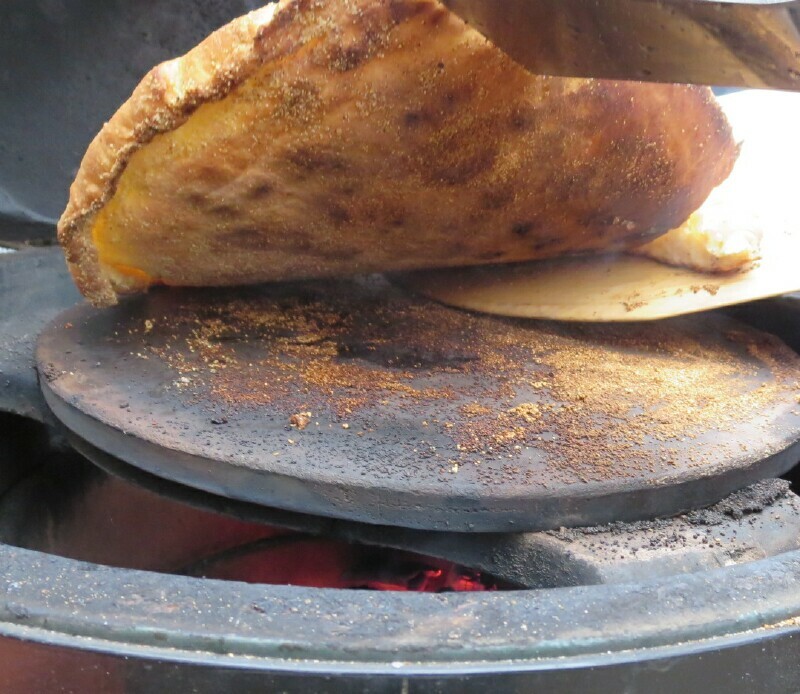 It is important to know the Pro can reach temperatures of 900 degrees (combination of charcoal and wood) rather than the Deluxe, which hits temperatures of 650. Prices for the Pro is $299 and Deluxe is $239. Limited time access to CI's review. Now if Dan figured out something that works just as well, that would be fabulous. I've stepped up my pizza game a little over the past year six months or so now that I have access to a wood-fired oven. 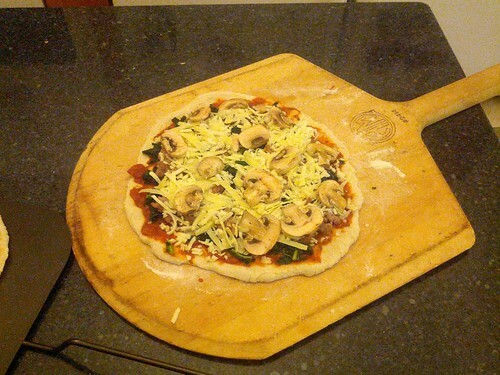 There's a steep learning curve to using the oven and our pizzas have really come a long way over the last few months. I've really been digging the recipes from Nancy Silverton's Mozza cookbook and using them as inspiration for new topping combinations. The idea of using whipped cream (sounds odd but it really works) on pizza alone is worth the price of the cookbook. 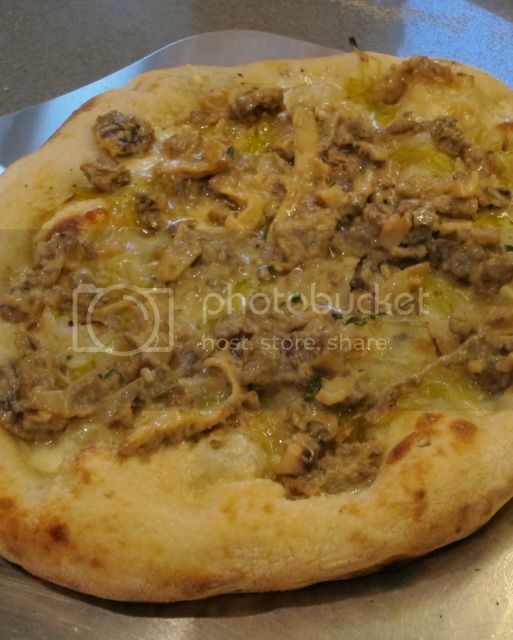 Has anyone put a pizza stone on the grill? Is that a bad idea? The problem is that you will have a very hot stone and by the time you transfer the pizza to the stone cool air around around the pizza. You want both a hot stone and hot air surrounding the pizza. I think I could do at hot coal circle around the edges of the grill. bean wrote: I think I could do at hot coal circle around the edges of the grill. 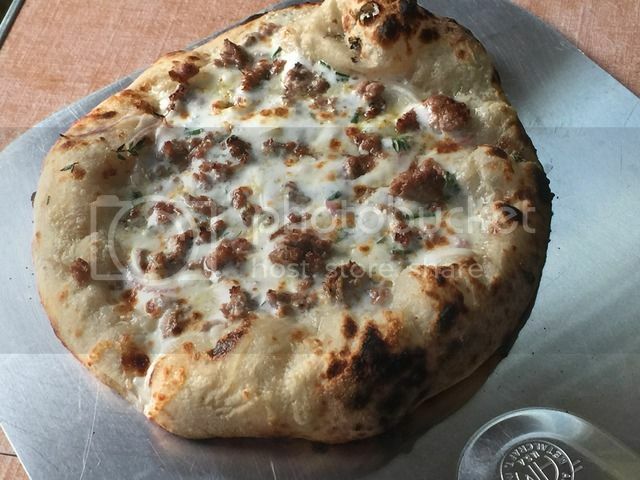 To hold in the heat properly, you need something like this http://www.amazon.com/KettlePizza-18-5- ... B005SFJLOI or this http://www.amazon.com/dp/B00PP47H4S?psc=1. I can attest to the kettlepizza option. I have the basic model and have great outcomes and no pizza stone issues using a combo of charcoal (starter) and fruit would. The newer model which also has a baking steel for the "roof" and easy loading openings is something I would lke to try too. Not sure if this is new, but I found Italian "granoro" brand of 00 flour at Mariano's in the Italian section. No pictures, but had one of our favorite Sunday meals tonight - cajun pizza. Reinhart crust which rose for 24 hours in the refrigerator. Reinhart red sauce infused with homemade cajun seasoning mix. Shrimp, dry brined for 30 minutes with salt and baking soda and then sprinkled with cajun seasoning mix. Homemade andouille sliced into quarters the long way and then medium sliced. Thin sliced Poblano. Thin sliced scallions. Topped with grated parmesean cheese. Cooked for 7 minutes on a cast iron pizza pan pre-heated in a 550 degree oven. The absolute key for me in cooking pizza is parchment paper. I like a very wet dough. I put parchment paper on the peel and with floured hands stretch the dough in the air and lay it on the parchment paper. 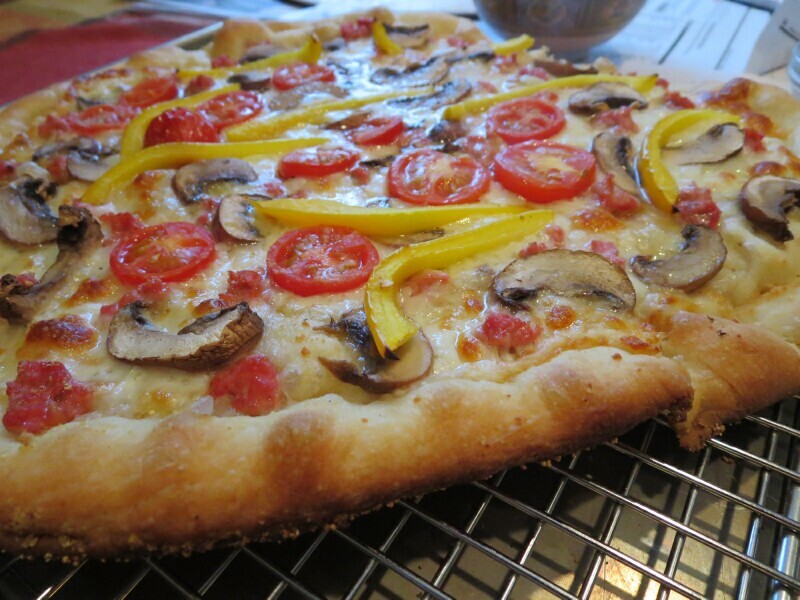 It goes onto the pizza pan in the oven and 2 minutes into the cook, it is easy to lift the pizza with a spatula and slide the parchment paper out of the oven and finish the pizza for 5 minutes directly on the cast iron pan. Which size Big Green Egg do you use. I have a regular big propane Weber, so this would be for pizzas, mainly. The small says it has a 13 inch grill, which would easily fit a single pizza, but would you recommend a larger size to get more air circulation? leek wrote: Not sure if this is new, but I found Italian "granoro" brand of 00 flour at Mariano's in the Italian section. Instead of pepperoni, I added green peppers, onion, and mushroom. I was able to find the necessary brick cheese ("Widmers") at the local Mariano's. I pulled it out of the oven a little too early; it could have benefitted from more browning. Also, I over-reduced the tomato sauce so it was a little too intense. But I'm looking forward to giving it another try. 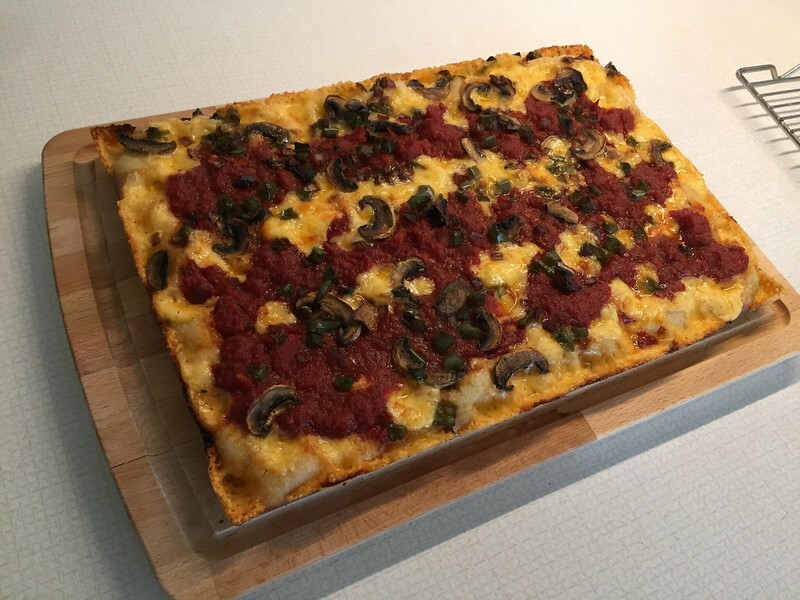 I'm in a phase where I want Detroit-style all the time. Caputo's (the store) has 00 Caputo (the flour) in 1kg bags. I believe Fresh Farms also carries it. 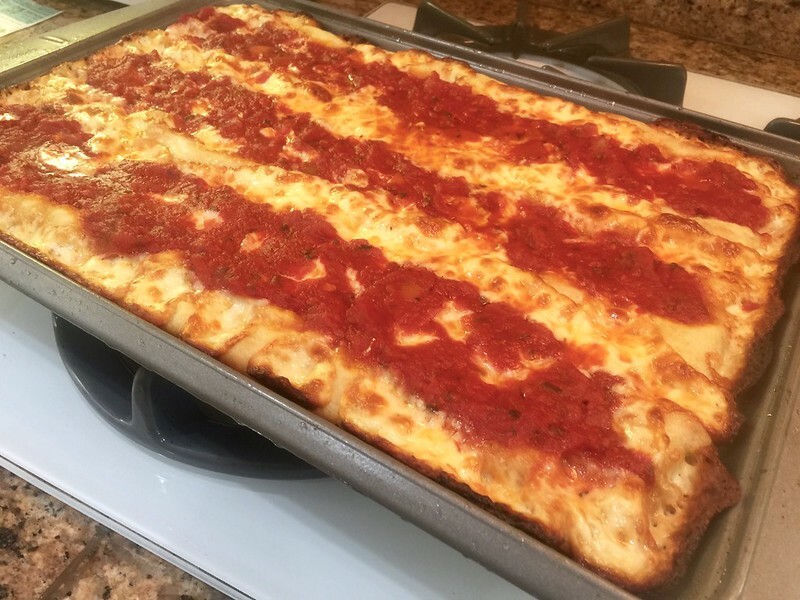 I made Kenji's Detroit-style pizza too and loved it. I made mine without toppings to suit various tastes, but it really didn't matter. The crisp, caramelized edges made this perfect. I made it while visiting California, where I couldn't find brick cheese, so I followed Kenji's recommended substitute and mixed Monterrey Jack & whole milk, low moisture mozzarella. One recommendation for those of you not used to working with sticky doughs (and this one is really sticky), wet hands are your friend. They'll help you spread the dough without it sticking to your hands, and without adding flour that would throw off the whole recipe. Anyway, the result is below. I should've taken some out of the pan to show you the char, but at least you'll get some idea.